ABP has invested £3.3 million into constructing a new bulk warehouse and new hydraulic crane, providing customers with access to upgraded facilities and equipment that will drive efficiency across the port. A new bulk warehouse over 3400 m2 in size and capable of storing a wide range of commodities is now under construction at the port. It is due for completion in July. ABP has also taken delivery of a new 120M Mantsinen hydraulic crane worth £1.1 million. The crane’s multi-purpose capabilities enhances the port’s ability to handle vessels with beams over 20 metres. The new investments were recognised in a ceremony at the port, which was attended by MP for North West Norfolk, Sir Henry Bellingham and Mayor of King’s Lynn and West Norfolk, Councillor David Whitby. 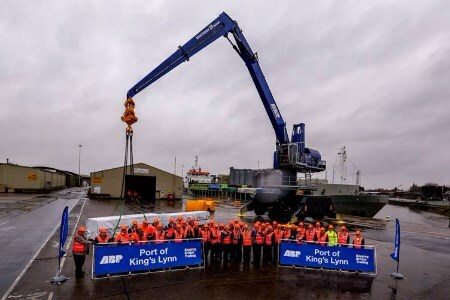 “The construction of the new bulk warehouse and the purchase of the Mantsinen crane is intended to support our customers by providing new facilities and equipment, supporting their growth by investing in the future of ABP King’s Lynn, concluded Harston.